A Sunchoke may look like a knobby potato, but its unique taste is sure to add texture and flavor to any dish or meal. Frieda’s Specialty Produce encourages shoppers to pick some up on their next trip to the produce department. Also known as a Jerusalem Artichoke, the Sunchoke is the root, or tuber, of the herbaceous sunflower plant. 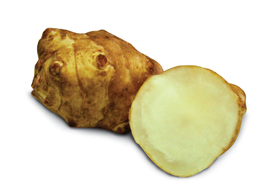 Resembling the Ginger Root, Sunchokes have a knobby, uneven shape with a thin brown skin and whitish flesh. They range from 3 to 4 inches in length, and 1 to 2 inches in diameter, Sunchokes are native to North America and commercially grown in the western United States. When selecting Sunchokes at the supermarket, choose moist, unblemished roots with smooth skin and no sprouting, and avoid dry and wrinkled products. Keep Sunchokes in your refrigerator, wrapped in plastic to retain their moisture.